We’re a happy family – The Boosters are hiring! "The openSUSE Boosters are a team of people helping developers of the openSUSE project to take off. It consists of people with skills ranging from low level C hackery over Ruby on Rails mastering to graphical design or project management. The team picks milestones and works on them in a agile fashion. They always follow their mantra: Grow community by enabling community"
"It took us a bit longer than expected, but now we are happy to announce, that SUSE Studio now also supports building appliances based on openSUSE 11.3. So you can take advantage of the latest and greatest features, which come with this release of openSUSE. We will continue to support building existing appliances on older openSUSE versions, but new openSUSE based appliances will all be 11.3." "Recently Henne Greenrock sent a status report about the Boosters Standup-Meeting here he said that nothing happened to the openFATE sprint. Well, that’s only partly true, so it seems to be time to take a closer look and revitalize the project openFATE a bit. What’s the matter with openFATE? We did a good start with openFATE to involve everybody who is interested into product planning. However, after the screening team was formed it turned out that some parts of the process are not yet working well. The biggest problem is still that the screening team members can not move features from state UNCONFIRMED to NEW which turned out to be crucial for a fluent process. So the Boosters picked up the task since we think this is a huge blocker to work together as a community effectivly." * Milestone: snapshot release without agenda. We release it once we have several new key components in. perl: This update fixes a crash caused by the use of constants. xemacs-packages: Xemacs fails to load customization files. Fixed by this update. mrtg: The execution of mrtg ends in a parse error when perl 5.12 is used. Fixed by this update. "OBS 2.0.5 is on the way to http://download.opensuse.org/repositories/openSUSE:Tools/"
Repositories: 22714 (+533) by 24157 (+98) confirmed users. "During Gabriel's talk at GUADEC, after working with members of the GNOME Foundation board, we were very excited to announce that the Amazon MP3 Store in Banshee would begin using an Amazon Affiliate ID, and that 100% of all revenue generated through this affiliate ID will go to the GNOME Foundation! This means that any time you purchase MP3s through Banshee's integrated Amazon MP3 Store, you are helping the GNOME Foundation help others." * Faster transfer of your program to the deployment system. * Support for Visual Studio 2010 in addition to 2008. * Polish, polish and more polish." "Yesterday I published a beta version of what is going to be a Community add-in repository for MonoDevelop. This web site is based on the Cydin project, developed during the last hack-week at Novell." "The "OpenJDK" version of Java is installed by default in openSUSE. This version of Java does not enjoy widespread compatibility. I have yet to find a site that properly works with this Java implemenaton and have promptly replaced it with a working Jave implemenation -- Sun. (...)"
"I have a Logitech MX900 mouse with an unused button on the top. The button looks like two stacked rectangles, and would be perfect for calling the desktop effect "Present Windows". (...)"
"Currently the updater applet has been working better than ever but there are some occasions where a large number of packages with a slow inet connection shows you an unpleasant app that you are not sure if it is working or not. Of course this is not only for slow connection, there are sometimes that it really takes a lot and you are not sure why. (...)"
"FreeRDP is a fork of the rdesktop project that intends to rapidly start moving forward and implement features that rdesktop lacks the most. 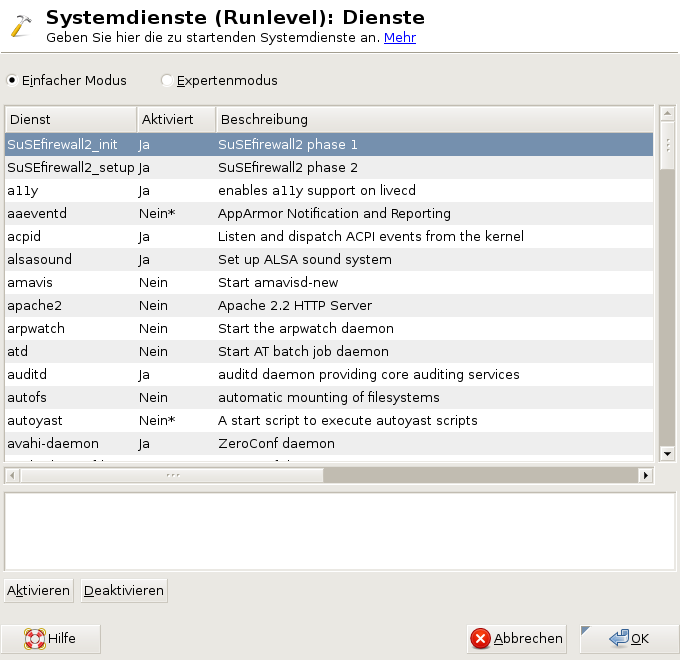 www.freerdp.com"
"The following picture taken from openSUSE reference shows the problem: The interface is in German but the descriptions are in English. The descriptions should be translated to the language of the GUI." "When installing openSUSE via the installer you can't select [x]Encrypt Device for the system root partition and continue installing since it shows you an ( unclear ) error message. (...)"
"After install or remove packages yast closes the package manager. In my opinion, a command to execute actions is not a command for quit module." A button or menu option em the package manager for referesh the repos is a good thing." "If i search two or more words in yast-pkg it search the exactly expression. It's a not nice default behavior. The search mode contaisn a option for ~"exacly coincidence" (my systen is in portuguese) but i the contais work how exactly and the exactly not show notging when a made a test search." "All configurations scripts are runed after a package transation. Some of then like GTK and texlive are prolonged and texlive splacialy is cpu intensive. If i install or uninstall a package without relation of texlive i don't need run it." "KDE has some testing nepomuk apps, mosly develop by mandriva. I nor find they in repositorys. They shoud be added in playgroun dos other testing repo." "KDE menus are shorted by app type and app subtype. I need 3 clicks for lauch anyone. The subtype is nice, but the adictional click not. A solution is put subtypes and apps in same leval using a tree view. maybe with autoexpand on mouse hover, but by default expanded." "Add TOMOYO as an option for security on OpenSuSE. It offers more features than AppArmor and with the correct YaST integration it can be made to work in the same "targeted" way as AppArmor does by default, offering powerful features to less experienced users without causing system-wide changes. (...)"
"The current start page for browsers is http://www.opensuse.org/. In my opinion the current content is not useful as a startpage which is kept by people. (...)"
Daily updated translation statistics are available on the openSUSE Localization Portal. "As of now I'm an employee of Novell. That means a couple of things. First of all: awesomeness, working with all of you! Second the boring stuff: I'll have to update linked-in and some other sites. And put a disclaimer on this site - my previous employer (the Dutch government) wasn't exactly involved in what I did for KDE... And I'll have to go through the administrative stuff in the company. Boy, do I look forward to that ;-)"
The openSUSE Weekly News are available as Livestream or Podcast in the German Language. You can hear it or download it on http://blog.radiotux.de/podcast. The mail lists have: 37696 (+17) subscribers. The most users ever online was 30559, 08-Jan-2010 at 13:06. 4883 (+22) of 12418 (+45) registered contributors in the User Directory have signed the Guiding Principles. The board has acknowledged 431 members. "Michal Hrusecky recently blogged about his openSUSE paste site. I just added support for it in pastebinit, a nice command-line tool to paste files (or stdin) to various paste sites. You can grab it (with susepaste.org support :)) from the network:utilities repository"
"On a request, I updated the openSUSE NX packages to the latest release, 3.4.0. If you're an NX user, please test the packages and report whether they work for you or not. As I don't use NX myself, I'd prefer to have a bit of feedback before pushing the changes to the X11:RemoteDesktop repository." "I've been busy working on a new implementation of our beloved "webpin", which is actually a service for searching for packages in the insane amount of repositories and packages we have, in the distribution, in all openSUSE Build Service repositories, as well as on Packman. The thing is, it's a bit dated now, and its features are limited by the fact that it's using a relational database to perform search operations. I've been digging into Apache Solr quite a bit over the last few months (did I already mention that it totally rocks? :)) and I thought.. hmm.. why not use that for indexing packages/repositories ?" To view the security announcements in full, or to receive them as soon as they're released, refer to the openSUSE Security Announce mailing list. "Leading up to the arrival of version 2.6.35 of the Linux kernel, The H published the final two parts of the Coming in 2.6.35 series, GNOME 3 was been delayed until March of 2011 and Oracle shut down PostgreSQL test servers. Anti-virus makers offered protection against LNK malware, 170 million Facebook data sets were collected and a hole in WPA2 was discovered." "Measures to support the power saving mechanisms of AMD graphics chips, network code optimisations for multi-core processors, features for de-fragmenting the working memory and an improved support of the power management and turbo features offered by modern processors are KL 2635 Logo among the highlights of the new kernel version." "James Morris, the maintainer of the Linux kernel's security subsystem, has integrated the kernel code for the AppArmor security extension into his development branch, which forms part of Linux-Next. Shortly afterwards, he announced that he also intends to send the code to Linus Torvalds for integration into the Linux 2.6.36 kernel. AppArmor can restrict applications to specific actions to prevent attackers who have, for instance, exploited a security hole in a server program, from gaining access to a system and causing major damage." "This photo manipulation is called a stereographic projection, which takes a standard photograph and stretches it around in a circle creating a Globe or Planet like image!" "Actually, I do not need mobile modem for mobile browsing because I mainly use internet access at home or by using public hotspot, but sometimes I need it when traveling and there is no hotspot available. I bought Vodafone-Huawei USB/HSDPA mobile modem E270, detected as K-3565 on Windows machine. The modem bundled with 3 GSM, local internet provider here in Indonesia. Price are about IDR 600.000,- , equivalent with approximately US$ 60, with free access bonus for 3 month. The modem also provide modem driver for Windows but sadly without modem driver for Linux. But, surprise, modem has successfully detected and works out of the box on broadband mobile connection-KDE desktop environment on openSUSE 11.3. Even better, I do not need modemswitch application to change from USB disk to USB modem." "Installing VirtualBox on openSUSE 11.3 has similar method as on openSUSE 11.2 with only a few changes : VirtualBox on openSUSE 11.3 need openSSL and PNG library as dependencies package. I’m using VirtualBox 3.2.6 64 bit on openSUSE 11.3 64 bit on this article. You may also use this guide for installing VirtualBox 32 bit, there is no major difference between 2 version." You might of course use dos2unix or recode, but this one works in-place, which means that you don't need to make a copy, work on the copy and then copy (heh) that file back onto the original -- here is how to do it with dos2unix: ..."
"LAMP is short for Linux, Apache, MySQL, PHP. This tutorial shows how you can install an Apache2 webserver on an OpenSUSE 11.3 server with PHP5 support (mod_php) and MySQL support." "Zimbra save all account and profile information on the LDAP database. Zimbra has no function for only import and export it’s account, although they have bundled Zimbra to Zimbra migration command. The Zimbra to Zimbra migration command export all mailbox and account while I only need a list of account with some primary fields like password, first name, full name, etc, especially for testing purpose only." "It’s looks like that I’m off and hiatus from blog for a while so it’s time to starting a new article and hope it’s not for the last one :-D .
KVM (Kernel-based Virtual Machine) is currently popular terms among the virtualization technology. What makes it popular and become the strong competitor for Xen Hypervisor are the technology behind KVM and Red Hat decision to move focus on KVM instead of Xen for next release Red Hat Enterprise Linux 6.0. What makes KVM gains an advantage on the technology side are the inclusion KVM module into Linux kernel so we do not need a patch or different kernel as we need for Xen Hypervisor. Beside the two virtualization technology above, those are various virtualization technology running on Linux : VMWare, VirtualBox, OpenVZ etc but Xen and KVM are quite popular among others." "Switching to a lightweight graphical desktop environment is a great way to improve the overall performance of your system, especially if this system happens to be a notebook or netbook. But if you opt, for example, for LXDE, you'll discover that it lacks a graphical tool for managing power profiles and controlling the processor frequency. This might not be a big problem on a desktop machine, but the ability to adjust power settings is crucial for improving the battery life of your mobile companion. The cpufrequtils utility provides a neat solution to this problem. This utility can help you to tweak power management options from the command line. cpufrequtils is available in the software repositories of most mainstream Linux distributions, so you can install it using your distro's package manager. (...)"
"I have upgraded my office workstation to openSUSE 11.3 today. Here I document the migration so that you don't have to repeat my mistakes. I went via the command line and ventured to keep all additional repos enabled. So switching the repos was done simply by sed -i "s/11\.2/11.3/g" /etc/zypp/repos.d/*"
"Every time that I make a new openSUSE installation, I always add some additional stuff to get an even better user experience, that’s why I enumerate here the things that i suggest to you do after a successfully openSUSE installation. Read well, read again, so you will not be lost. All the commands that I show here between double quotes (“) for the time of the execution will go without the quotes and with the text in bold just like that." "KDE 3.5 was originally released almost five years ago, the last maintenance release clocking in mid-summer of 2008. Regardless of its age, a half-decade after its debut some KDE users still prefer KDE3 over KDE4. For openSUSE lovers who also love KDE3, the discontinuation of support for openSUSE 11.0 represents the last major release of openSUSE that shipped with KDE3 as an installation option (it actually bundled KDE3 and KDE4 with it). Wouldn't it be great if you could get all the delicious goodies introduced in openSUSE 11.3 without needing to give up Amarok 1.4 and adjusting to all the sweeping changes made in KDE4?" "As I mentioned in two earlier blogs now, within openSUSE a strategic discussion is going on - what direction should we, as a distribution community, take? I would like to address a few things in this post. First of all, why a strategy, and what will it and won't it do? Second, there is one strategy I'd like to mention specifically, as I think it's disrupting but as a community proposal it deserves to be discussed as any other strategy. That's about the KDE strategy for openSUSE." "So some other things happened with openSUSE Paste so I want to inform you about the current situation. We have http://susepaste.org address, right? So from yesterday, we also have http://paste.opensuse.org. Same computer, same IP, just different name if you prefer the other one. As it is the same thing as susepaste.org, links are interchangeable. So you can post something to susepaste.org and send link to paste.opensuse.org or vise versa. Just replace the first part of the url. Other interesting thing to report is that Pascal Bleser added support for susepaste to pastebinit, so if you don't like mine simple script, you can use more advanced tool face-wink.png But this is nothing new, he already blogged about that. Next steps on openSUSE Paste includes localization, documentation for the script and getting it to the common menu on all openSUSE sites. But I need to get back to other things for a moment so it has to wait a little bit"
The Alfresco wiki covers a few of the clients that are available out there. Let’s add another type to the list: JMX from the command line. There are a couple of options for us to choose from. I am partial to jmxterm from CyclopsGroups.org"
Since the previous post, I worked on improving the patches that add local caching, fixed a few bugs, addressed review comments from the community and re-posted the patches. I also gave a talk about it at the SUSE Labs Conference 2010 took place at Prague. The slides can be found here: FS-Cache aware CIFS." "I received an email from a user who switched from openSUSE to Ubuntu since his Wireless netcard did not work. It worked with openSUSE 11.2 initially but after an online update it failed. He hoped that openSUSE 11.3 worked, tested it, it failed – and he gave up and wrote a frustrated email. I was frustrated reading this since we should have been able to help this user if he contacted us in time." "A few hours ago asked Pavol me if I have a openSUSE graffiti with an geeko. Of course I have one, he said he needs it for some slides for his Launch Party on friday and I said I have slides with such an graffiti on it and send it to him. After a few minutes he said, thats exactly what he working on. We both had the same idea, we reusing Hennes and Vuntz talk from LinuxTag 2010. And here it is “The ultimate A-Z openSUSE Contribution Guide” in graffiti style." "I raised a topic on this issue where it seems the stock kwin is having issues with video playback when desktop effects is ON. Already some similar experiences recorded." Live CD will not boot? "Looks like it turned out to be a 'nomodeset' issue and @oldcpu seems to have solved this one for the OP. Nice work Lee." So where are all the Updates? "User questions why there are so few updates?? :-) Was making a comparison with other distros that have a shed load of updates post install. It's very early days though for 11.3, I expect such questions would not arise in 6 months time, when there is sure to be plenty of updates." "Already switched to Factory on my sandbox and have 11.4 there now and looking forward to the milestone releases soon." "GNOME and KDE are teaming up again to host the 2011 Desktop Summit in Berlin, Germany. Due to the success of the 2009 Desktop Summit the projects will co-locate GUADEC and Akademy once again in August, 2011 for the largest free software desktop event ever. The 2009 Desktop Summit was a fantastic opportunity for the leaders of the free software desktop community to share talks, address common issues, and build relationships between the communities with combined social events." "When KDE 4.0 was released, it was clear that it was not finished and not ready for production. By version 4.2, the completely redesigned and recoded desktop environment was starting to regain the stability and depth that many loved about KDE 3, while also adding new features that make KDE a unique and rewarding desktop software compilation. Just as KDE 3.5 was intended to be a stabilizing, long-term release, the primary goal of KDE 4.5 is to fix outstanding bugs and increase stability. Users will not be blown away by the new features, but there are a few worth noting. Last week I installed the release candidate for KDE 4.5 from the Kubuntu repositories and took it for a spin." "f you’re wondering exactly what MeeGo is, it’s a combination of Intel’s Moblin and Nokia’s Maemo project. This lightweight combination targets smartphones, netbooks, tablets, mediaphones, connected TVs and In-Vehicle Infotainment (IVI) systems. This specific release is for Atom-based IVI systems. These systems are designed to deliver things like navigation, entertainment, and networked computing services inside of cars, trucks, buses, planes and more. On their website MeeGo states “As vehicles become connected to the internet, the demand for internet-based entertainment applications and services increases and MeeGo strives to accelerate the pace of innovation in IVI.”"
The new look Techblog: In Search of the Perfect KDE4 Distro – 2 Why Not openSUSE 11.3? "Okay, I have spent more than a week with openSUSE 11.3 KDE4. Right now I am downloading Linux Mint 9 KDE. I have not decided on my perfect KDE4 distro, but openSUSE 11.3 is a really strong contender. In this short writeup I will explore some reasons why I might NOT switch to it as my default OS." "About two weeks ago, the openSUSE Project released version 11.3 of its popular Linux distribution, and after putting it off for quite a while, I decided to give the latest version a download and see what SUSE has been up to. After all, the last time I took a serious look at SUSE (over four years ago! ), it still went by "SuSE"... yes, it's been quite a while. So far, my initial impressions of the latest version are quite good. The latest version of openSUSE, as expected, includes updated versions of all the software found in the distro, along with a couple of new bundled applications, such as SpiderOak for net syncing and Rosegarden for audio editing. It also includes KDE 4.4.4 and the 2.6.34 Linux kernel, and believe it or not, it even includes a preview of GNOME 3.0 for those who are interested in testing it out." "Contributor Agreements, also known as Contributor License Agreements (CLA), are increasingly being adopted by open source projects. This article explains the purpose of these Contributor Agreements. (...)"
Do you have comments on any of the things mentioned in this article? Then head right over to the comment section and let us know! Or if you would like to be part of the openSUSE:Weekly news team then check out our team page and join! Or Communicate with or get help from the wider openSUSE community -- via IRC, forums, or mailing lists -- see Communicate. This page was last modified on 15 August 2010, at 15:36. This page has been accessed 63,311 times.